Is your job like rollerskating in a buffalo herd? 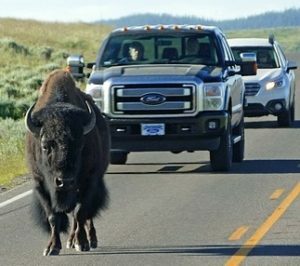 You can’t drive in a buffalo herd either. I talk to many job seekers who want to change careers. Some of them are accountants who should be salesmen. They got into accounting because it is safe, pays well, and has a great future. Their personality is wrong for accounting. They don’t like carefully following precise rules. Reporting on what other people are achieving gives them the itch to do more, not the pleasure of a job well done. Some people who want to change careers are salesmen who should be accountants. Salesmen make so much money that, for some, it is irresistible to get into sales. The “should be accountants” are great with logic, and to them, buying is all about carefully planned decisions. But developing relationships quickly is not their way of living. Pressing emotional buttons feels somehow wrong. Sales is just not working. If you have the wrong personality for your career field, CHANGE. Do it now. You will only have more obligations in a couple of years. The first step is to work within your current company to see if you can switch careers. Will they let you go from being an accountant to being a salesman? Can you go from being a salesman to being a sales engineer or financial analyst? Is there a way you can exploit your current job? Often you have to change companies to change your career. You will probably have to take a big cut in pay. Only you can decide if it is worth it. One more thing to consider. Is your career the problem, or the people you are working with? I don’t know any accounting companies that are filled with rollicking, frolicking, totally off the wall, hard charging adventurers. I do know that accountant personalities range from nearly dead, to micromanaging bosses from hell, to nurturing versatile entrepreneurs with great attitudes. Carefully look at your situation. Make sure that your company and the people you work with are not the real problem. You may still need to change jobs, but your career may be fine for you. Don’t settle for a job or career that you just can’t be happy with. Seriously look at what it will take to work with a better bunch of people or to switch careers entirely. Life is too short to choose misery. Go online or to your local job center and take a personality test. You will be surprised how accurate they are.